The train here is being pulled by loco no. 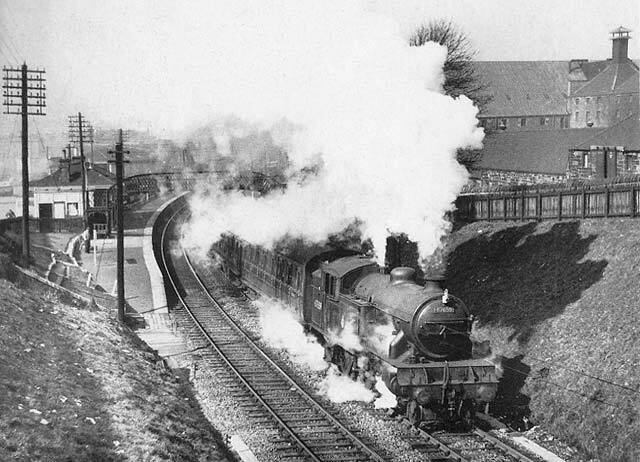 67659 out of Gorgie East station in April 1958. "I just clicked on Gorgie station 1958 and got this wonderful memory. My Dear Mum took us in the train to visit my Auntie in Duddingston nearly every week. There was a waiting room with forms to sit on while you were waiting for the train, and best of all was the little chocolate machine where we put our pennies in and out came a bar of Cadburys chocolate. The station guard's house was near the station. As we lived in Hutchison Road we just had to cut through the field to get to the station. We cut through the same field to get to Craiglockhart school and later on Tynecastle school though we often cut along the railway tracks as well !!!!! - not to be recommended !!!!!!"